Very few plant managers think about their thermal process control systems unless there are obvious signs of problems or fallout from a failed audit. That can be a mistake because an investment in process control instrumentation can add considerable efficiency and accuracy to your production processes while improving performance and enhancing the bottom line. You may not even realize that today’s process control systems can do so much. 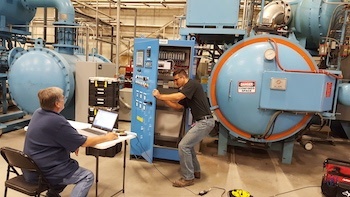 Modern systems help furnaces, ovens and other thermal processing equipment deliver precise heat over exacting timelines, but they can also ease the burden of operating, monitoring and recording data for these devices, making day-to-day operations easier and allowing for simpler and more accurate audit compliance. The latest control systems can be programmed to provide “one-touch” operation, which saves countless man-hours over time while eliminating input errors. These simplified human-machine interfaces (HMIs) are much easier to operate, require less operator training and take the guesswork out of obtaining repeatable results, by utilizing tools such as recipe management. Quality Issues. If your output is inconsistent, you are experiencing production losses, or you’re not measuring up at audit time, consider how new process control systems can consistently meet the most demanding standards of just about any industry. Inefficiency. Operating thermal processing equipment with today’s process control tools can be incredibly simple with human-machine interfaces that make repeatable production results a one-touch process. Audit Challenges. An audit should not be an agonizing process. A great process control system will provide communication between devices, log and store production data, and ensure that records are easily accessible so you can handle any auditor’s data request quickly. Multiple Systems. The equipment in many facilities has been upgraded in a piecemeal fashion, leading to multiple sets of software and hardware, supplied by differing vendors This means more parts to inventory, more time to train workers and more variability in production processes. A single, well designed process control system can solve most of these issues. Monitoring Problems. If you’re having a hard time keeping track of your equipment and its output, you need an updated process control system that essentially monitors devices for you—and provides you with access to that data anywhere in the world with an internet connection. These are just a handful or reasons an upgrade of your process control instrumentation is likely to more than pay for itself. To learn more about the latest tools, see this article in Industrial Heating magazine, written by our own Christopher Miller. Of course, process control devices and systems are complex and upgrading them is a significant undertaking. If you decide that the time is right to evaluate your systems, be sure to work with a credible team that can evaluate your current equipment, maximize the use of your existing hardware and perform a proper engineering study to ensure you get the right process control system for your needs. If you have more questions about modern process control devices and systems, contact Conrad Kacsik.